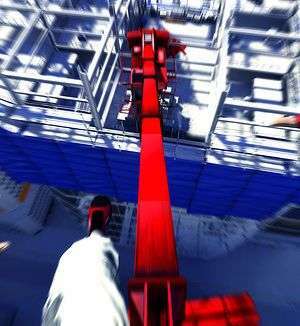 Despite the recent movement of shooters incorporating elements of parkour into the mix, the free running escapades of Mirror’s Edge remain as unique, fresh, and exhilarating an experience today as it was eight years ago. Quite frankly, there’s never been anything else like it. Thanks to a combination of striking visuals (which still largely hold up well today), downplayed gunplay and an overall innovative approach to the genre, DICE’s First Person Sprinter has a look and feel that’s wholly its own. Mirror’s Edge is a game about flight, not fight, where the aim is to run away and actively avoid confrontations, only engaging in combat as a last resort. It’s the polar opposite of what we’ve been taught not only by other first-person games but pretty much all games in general, and for a work by DICE, who are best known for the Battlefield series, it proved quite the contrast and a risk in the then emerging market of military shooters. Indeed, Mirror’s Edge came out at a time when publisher EA seemed to be laying a lot on the line by defiantly pursuing new and creative IP. Don’t forget Visceral’s survival horror instant classic Dead Space only released a month prior to Mirror’s Edge at the close of 2008, a dependably jam-packed time of the year which is surely a factor in explaining why neither enjoyed huge chart success. After years of mostly churning out nothing but annual sequels and shoddy licensed games, public perception of the publisher wasn’t what you’d call positive, and so these new endeavours, despite ironically being the fresh experiences players were demanding, and the only new major IPs in a Christmas dominated by games with numbers at the end, were likely side-lined in favour of the more familiar names out of not totally unwarranted caution and cynicism. Of course, the other reason behind those low sales, for Mirror’s Edge at least, might be because it’s not a great game. Not really. It’s a great premise, though, a superb one in fact – a parkour platformer in the guise of an FPS, as opposed to an FPS with shoehorned-in platforming – just one which needed more time for a better game and story worthy enough to be fitted around it. Mirror’s Edge is a deeply flawed game on so many levels, but it’s testament to the strength and fascination of that core concept, as well as the style with which it pulls it all off, that its appeal has endured over the years amongst its dedicated fanbase. Set in an immaculately kept city (which goes unnamed throughout) ruled by a totalitarian government, you’re placed in the running shoes of Faith Connors, a member of an underground network of couriers known as Runners, parkour experts who make a living delivering their clients’ messages via the rooftops so as to keep any critical information they carry away from the prying eyes of the city’s controlling and surveillance obsessed overseers. Everything is watched under close scrutiny here; communications are monitored, the media is controlled, and the population spied on. If you so much as drop litter (not that you ever should, of course), chances are you won’t be able to get away with it. It’s a novel and original set-up, certainly as far as the implications for gameplay are concerned, but also in its presentation. Sure, we’ve seen dystopian societies before (and countless more since), but this isn’t your token run-down metropolis riddled with crime and grime, where poverty runs riot and chaos reigns supreme. On the contrary, at first glance at least, the clean and crisp yet eerily empty city skyline of Mirror’s Edge seems like a most pleasant and peaceful place to live, the constant invasion of privacy and murderous conspiracies behind the scenes notwithstanding, that is. Speaking of which, Rhianna Pratchett’s story revolving around Faith’s sister Kate being framed for murder, and the uncovering of a plot to take out the Runners for good, is a far less inspired affair than the setting it plays out in. 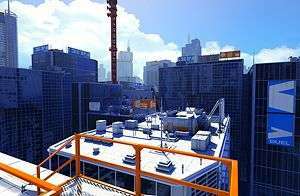 Hackneyed, poorly written, and all too predictable, Mirror’s Edge’s underdeveloped story aims high but, just like Faith after a misjudged leap, falls flat on its face with an excruciating crunch and stomach-churning splat. With a minimal cast (although others who don’t appear onscreen are mentioned), a so-called plot twist surrounding a rather athletic killer’s identity is robbed of any mystery or impact seeing as it’s hard not to immediately deduce who it is, and come the unsatisfying cliffhanger ending after a mere four hours (although Lisa Miskovsky’s Still Alive playing over the credits is a nice reward for getting there) you don’t have any real sense of who any of these characters actually are, nor any idea why the bad guys are so oppressive in the first place. By virtue of being the leading lady, Faith is naturally more fleshed-out than the rest of the cast, a tragic albeit tenuous backstory and a devotion to do what’s right by her sister motivating her choice of career and actions. It’s not great amounts of depth, and she’s not a particularly well-written or well-acted character either unfortunately, but Faith has nevertheless found fame as one of gaming’s most notable female leads in recent years. Her refreshingly non-sexualised appearance has been praised amongst the community, bucking trends with her more practical wardrobe and unexaggerated figure, while her trademark tattoos up her arm and beneath her eye make her instantly recognisable, if stopping short of iconic. Of course, it’s Faith’s physical capabilities which define her the most. Not only can she handle herself in a fight, able to disarm opponents with a well-timed button press or pummel them with a flurry of kicks and punches, she can also run across walls, leap impossible distances, and sprint at speeds so fast she could probably give Usain Bolt a run for his money. Thankfully, DICE’s streamlined and uncomplicated control scheme keeps things simple, especially considering the first-person perspective. With upward movements (jumping and vaulting) mapped to LB/L1 and downward motions (sliding) to LT/L2, you’re able to keep your thumbs firmly on the analogue sticks and thus keep Faith always on the move. Likewise, attacks are triggered with RT/R2, meaning a tap of jump followed by attack will send Faith jump-kicking into an enemy’s face without completely breaking her flow, although stopping to engage in a proper fistfight will naturally bring her to a halt. For a game about keeping up momentum, Mirror’s Edge is at it its worst when you’re brought to a sudden stop for a punch-up or shootout. Not only is the brawling clumsy, the disarm mechanic unwieldy, and the shooting hollow, it all feels like it was made separately from, and not in conjunction with, the star attraction of free running. They don’t fit nicely together, the fighting detracting from the running, and whether things would be better off if combat were more polished or omitted entirely is unclear. Most fights, however, can happily be circumvented by running straight through, but this can sometimes leave you open to being shot down when slowly scaling up a pipe or swinging across a series of bars to make your escape. Yes, you’re rarely forced to fight, but sometimes it will make life a lot easier if you do. Even with the ground troops out of the way, though, there are still plenty of times where you’re being shot at during one of Mirror’s Edge’s numerous chase sequences. Luckily, the focus here is often purely about running away, which is where the game’s strengths lie. Sliding down half a skyscraper, hurtling from one rooftop to another, smashing through glass and bursting through office doors is an exhilarating rush, and there are some great set-pieces peppered throughout some nicely colour-varied environments involving jumping onto moving trains and, in homage to 007’s parkour pursuit at the beginning of Casino Royale, leaping from one crane to another. It’s just a shame the levels don’t offer as much freedom as you’d hope. DICE conjure up the illusion of letting you choose your own path at first, but you soon realise there’s only ever really one way forward. Ironically, for a game set in a city where its citizens’ choices are restricted, the same is true of the players’. However, despite levels basically hemming you in, Faith’s Runner Vision highlighting useful objects to help you navigate the environment in bright red, and a button that faces you in the general right direction when lost (which feels like a subtle admission of some bad design on DICE’s part), there remains an awful lot of trial and error in getting from point A to point B. Ascending an atrium filled with scaffolding late in the game might be a seen as a challenging navigational puzzle to some, but to others it can be a frustrating exercise in not knowing where to look next and repeatedly falling to your painful-sounding doom. And coupled with the frequent and long elevator rides clearly disguising loading screens, the pace can falter immeasurably at times. You really have to learn the layouts of each level inside out to play Mirror’s Edge at its best, when you’re able to chain multiple wall-runs and jumps seamlessly together, completing a chapter in one unbroken stream of movement. It’s perhaps why, then, Mirror’s Edge is most fun when played as a straight up speedrunner. With the weak story removed from the equation, you can tackle each level against the clock, given only a matter of minutes to qualify. Alternately, you can compete in the time trials which take specific sections of certain chapters and place a number of checkpoints for you to pass through within them. 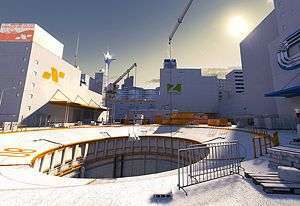 While the campaign has its defenders, most fans of Mirror’s Edge can claim to having lost a weekend or two in pursuit of achieving a perfect speedrun under time for each level and attaining all three stars on every time trial course. Even though you’ll largely be following the same critical path as those found in the campaign levels, testing your reflexes, devising corner-cutting shortcuts, and learning and mastering your personal optimal route in order to shave off of few milliseconds could be a simultaneously addictive and infuriating pastime for some, bringing out a one-more-go mentality which could keep you hooked for hours on end. It’s telling the game’s only DLC pack was a bunch of new time trials rather than an extra story chapter, because it was clearly this portion of the game where players were being most absorbed. Come for the campaign, stay for the racing. Yes, it’s all too easy to level criticism at Mirror’s Edge’s main offering – the story is poor, its duration brief, and the levels restrictive – but overall it’s equally deserving of praise and recognition for being a genuinely daring, bold and unique one-of-a-kind experience. 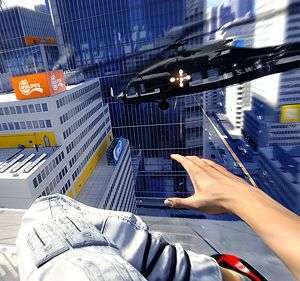 Today, games like Call Of Duty, Dying Light, and Titanfall all owe a huge debt to Faith with their parkour-enhanced movement systems, but none can match her when it comes to the purity, thrill and intensity of first-person free running. For all Mirror’s Edge gets wrong, it gets that core concept about as right as any game probably ever could at the time, and even though the rest of the game failed to live up to it, there was little a sequel wouldn’t have been able to fix. If ever there was a game in need a sequel to perfect the formula, it was surely this one. Sadly, Mirror’s Edge wasn’t a big seller, and despite years of sequel rumours circulating the industry, nothing ever materialised. 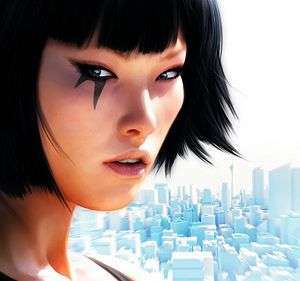 Until E3 2013 that is, where EA finally lifted the curtain on a new Mirror’s Edge, showcasing some behind the scenes footage the following year, and revealing the game’s full title the next. A reboot charting Faith’s younger years, Mirror’s Edge Catalyst takes everything that was good about the original and runs with it, while pleasingly remaining recognisably Mirror’s Edge and Faith recognisably Faith. Guns have been dropped entirely in favour of fast and devastating melee strikes, Faith has new moves and tools to aid traversal, and it all takes place within the gorgeous-looking Frostbite-powered open-world City Of Glass, which looks set to put the “free” in free running. Mirror’s Edge Catalyst is undoubtedly one of the most exciting-looking prospects of the year, and early evidence suggests it’s going to be the game Mirror’s Edge always should have been and the game fans always dreamed of. Nevertheless, there is reason to be a little cautious, most notably DICE’s track record. When it comes to technically impressive online shooters, the studio certainly know their stuff, but outside of their forte is a bit hazy. They’ve never made a truly great single-player campaign before, they’ve never made a contemporary open-world game on this scale before, and they’ve never made an exclusively melee-based combat system before. Then again, nobody has ever made a game like Mirror’s Edge Catalyst before. It’s hard to deny there’s every reason to doubt DICE’s ability pull it all off, but sometimes you’ve just got to have a little faith.